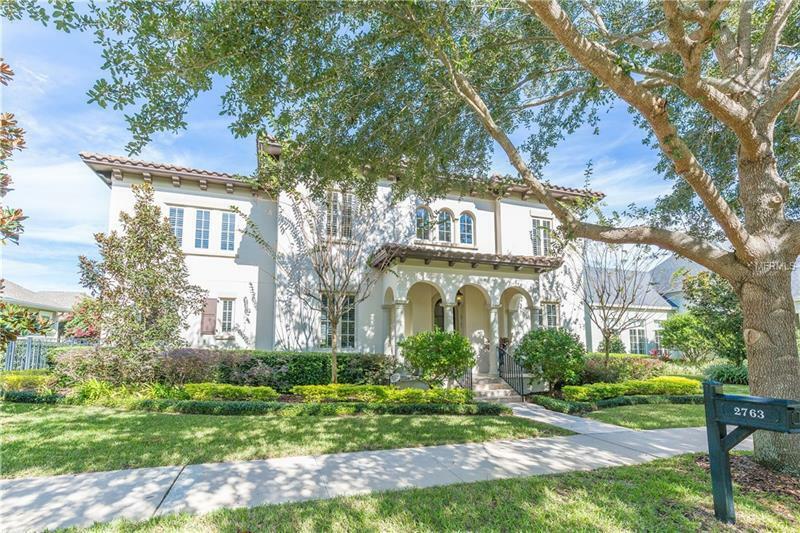 Ideally located on a one-way street overlooking a mews this stunning Baldwin Park home boasts 5 bedrooms 6.5 bathrooms and over 5000 SF of well-designed living space with custom built-ins throughout. The open 20-foot foyer greets you with a grand staircase ahead private office to the right and formal dining to the left. Above both dining and family rooms hovers an elegant cypress wood ceiling. The dining room leads to an over-sized kitchen with a massive island wrapped in cabinets. The open floor-plan is perfect for entertaining with a large dinette built-in work station and an additional 7x13 sitting area off the kitchen. The family room has 15 foot ceilings and custom built-ins. French doors line the back of the home and lead to a covered lanai with a built-in grill overlooking the salt water pool and spa. Surround sound powered by Casa Tunes can be enjoyed inside and out. The conveniences of this home are never-ending with a downstairs laundry room powder room pool bath and a Master suite with a dreamy bathroom and an expansive walk-in shower with multiple heads. Climb the back staircase to find a bonus room 3 bedrooms 3 full baths and multiple storage closets. The detached 3-car garage includes an upstairs living space with 1 bed (the 5th bedroom) & 1 bath and a laundry closet accessible through a private entrance plus this bonus area is plumbed to add a kitchen. This is a rare find in Baldwin Park with elegance and function. Simply a fabulous home. Floorplan available!